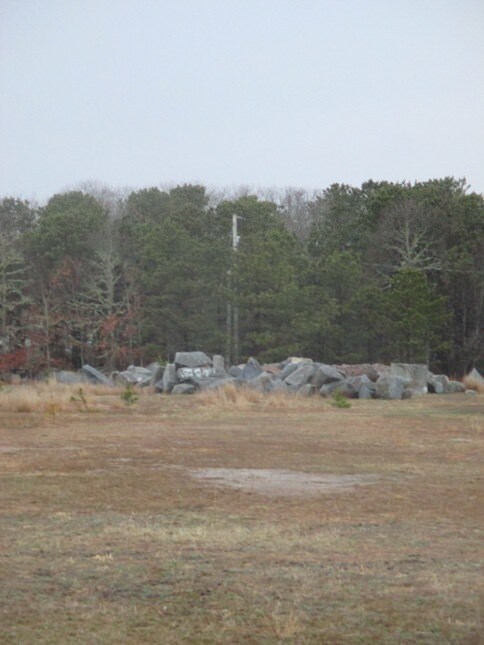 Many weeks ago a large mass of boulders appeared in the old drive-in theater lot, owned by the Town of Yarmouth, and abutting Parker's River. 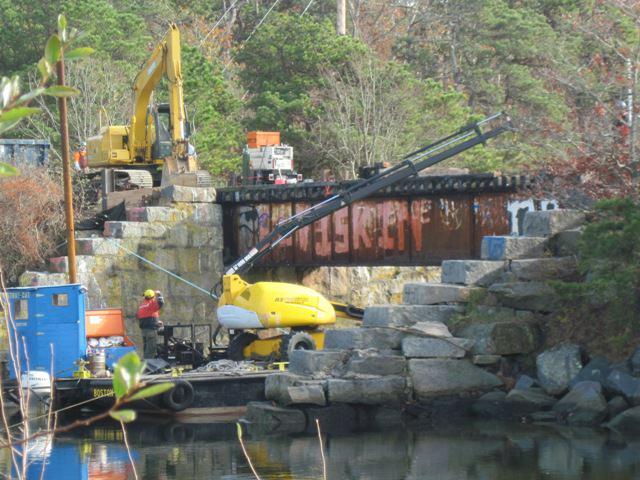 It didn't take long for us to realize that these stones came from the old Bass River Railroad bridge, which stood for over 160 years, until dismantled and replaced as part the Cape Cod Rail Trail's Expansion. Below we see workers preparing the remove the old bridge in 2010. Above we see the bridge's final stand. 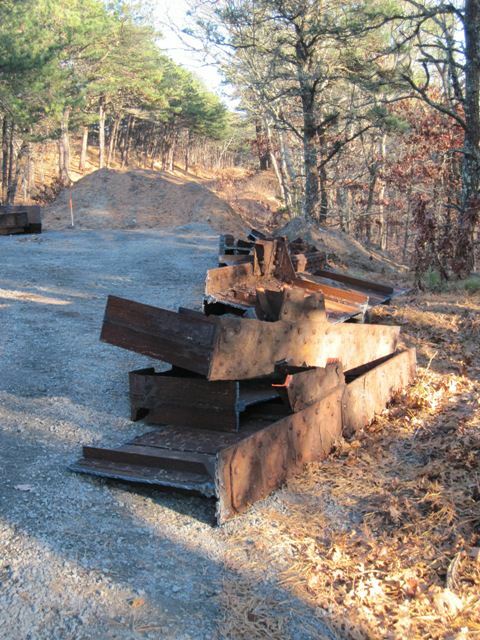 Below we see rusted remnants of the dismantled bridge. 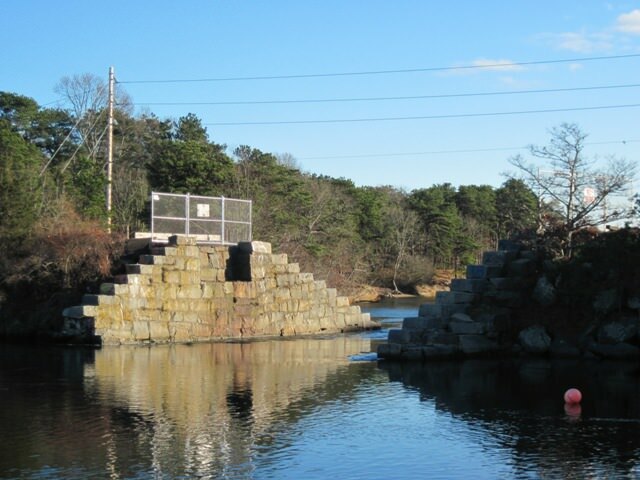 The old bridge abutments, a portion of which which now reside in West Yarmouth. 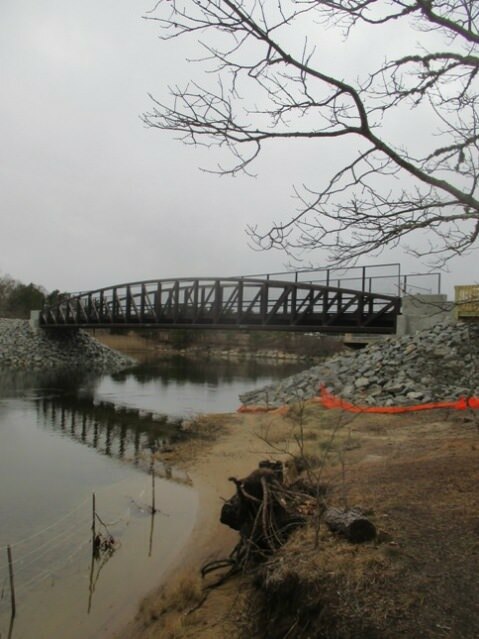 A wonderful new bike bridge now crosses Bass River at the site of the Rail Bridge, and the channel has been widened, improving navigation and the river's ecosystem. For the fifth year in a row Yarmouth Police Department hosted White Ribbon Day at Cape Cod Irish Village. This event, largely made possible by Independence House, asks that men and boys take this pledge. “From this day forward, I promise to be a part of the solution in ending violence against women.” Support for this event came from Independence House, Cape and Islands District Attorney's Office, Yarmouth Police department and countless other individuals. Police departments from all across The Cape were represented at the event. Below we see Independence House Director Lysetta Hurge-Putnam. Below, District Attorney Michael O'Keefe addresses the crowd. Sheriff James Cummings appears below. 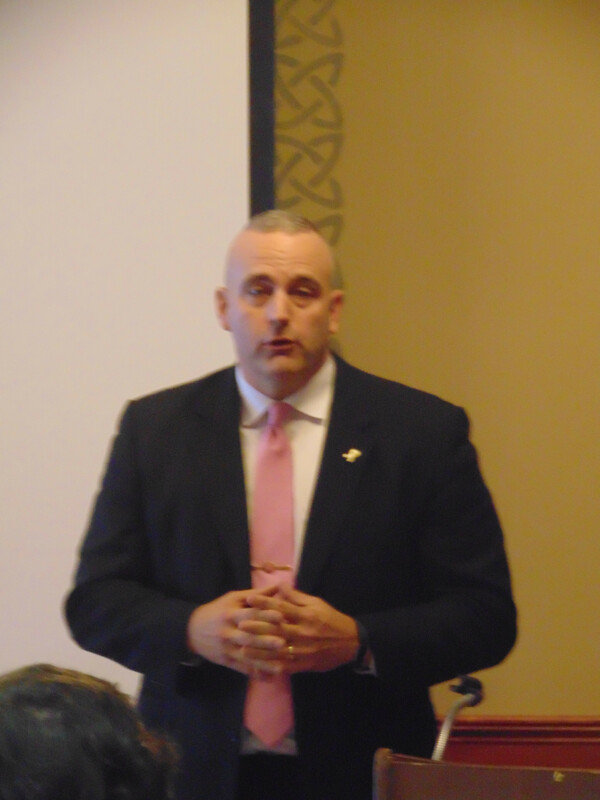 State Representative Tim Whelan describes his experiences as a State Trooper responding to domestic violence. Above we see Cape Cod's newest legislator, Julian Cyr. Below, State Representtaive Will Crocker. Special thanks goes out to Independence House, Yarmouth Police, and all the participants taking the time to attend. Yarmouth Police, Yarmouth Food Pantry "Stuff a Cruiser" event! Local officers and pantry volunteers join forces to collect food donations. Saturday, shoppers saw volunteers in action at 3 Yarmouth supermarkets, where officers and pantry staff held their "Stuff a Cruiser with Food" event. This event has become a tradition over the past several years, highlighting the needs of the community and the robust response of these organizations.One location for this event is the Stop and Shop in West Yarmouth. Above from left we see Sgt. O'Malley, YPD, Yarmouth Food Pantry exchange student volunteers, local Pantry volunteers, and Lt. Kevin Lennon representing both YPD and the Yarmouth Food Pantry as a Board Member. Below we see the group at South Yarmouth Shaw's. From the right is YPD Officer Kevin McIsaac, (semi-retired), Barry Clayman from The Yarmouth Food Pantry Board, Gail Clayman from the YPD Community Advisory Team and Gene Fischer, Pantry volunteer. The third donation site, Stop and Shop at Station Avenue, was graced by numerous Pantry volunteers and the Yarmouth Police Department was represented by Officers Christopher Eccleston and Sean Brewer. The Yarmouth Food Pantry has helped thousands of folks by providing literally tons of food to those in need. Volunteers showed that the effort is truly regional, with weekly pick-up trips from off-Cape distribution centers. The partnership between YPD and Yarmouth Food Pantry sees full commitment from the organizations. Several YPD officers have served on the Pantry's Board of Directors.Such networking among various service organizations helps to advance interrelated goals. 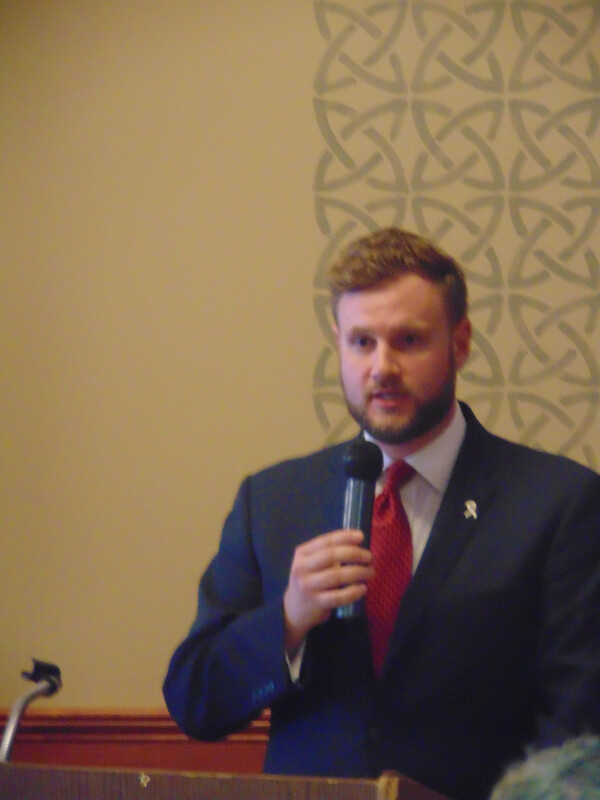 Independence House Hosts White Ribbon Day. Men pledge to end violence against women. On March 5, independence House hosted their annual "White Ribbon Day" at Cape Cod Irish Village. Local residents and community leaders fought the snowy morning to gather at this event, which asks men to make the following pledge." From this day forward I promise to be part of the solution in ending violence against women." Above we see Yarmouth Police Deputy Chief Xiarhos and Yarmouth Police Officer Melissa Alden. Xiarhos commented on the changes in domestic violence law, that in the old days, officers could not make an arrest unless they personally witnessed an assault, and that modern times have brought better enforcement and increased awareness. Ms. Alden, also an attorney has worked tirelessly on community issues such as these. US Army Chaplain Don Florio led the group in prayer. Below we see District Attorney Michael O'Keefe, whose office unfortunately deals with these issues every day. O'Keefe noted efforts on the part of his office to advocate for victims, prosecuting abusers and keeping victims notified when abusers' detention status changes. The DA noted that taking the time to recognize this issue does not detract from our other challenges, that we have "many balls in the air" in dealing with such interrelated social ills. 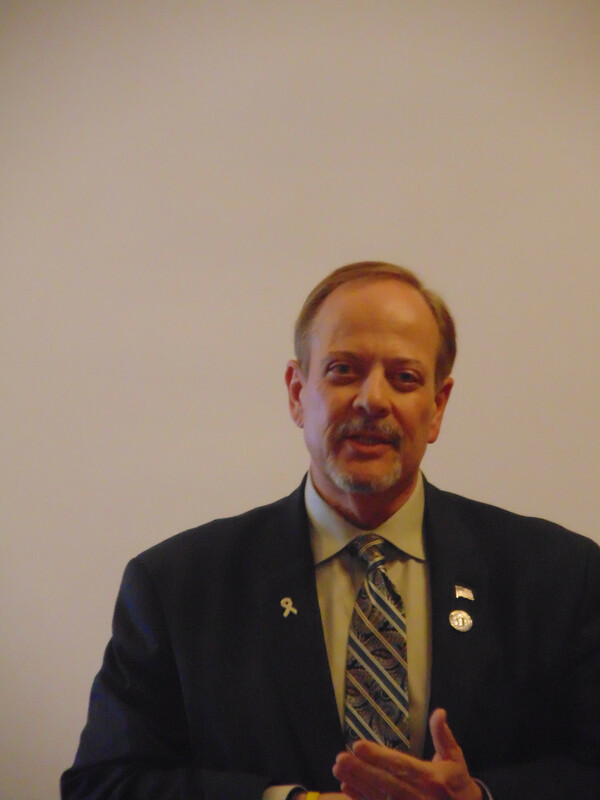 State Representative for the Second Barnstable District, Brian Mannal, told of how one simple symbol, a small white ribbon can inspire much larger conversations about how we deal with violence against women. 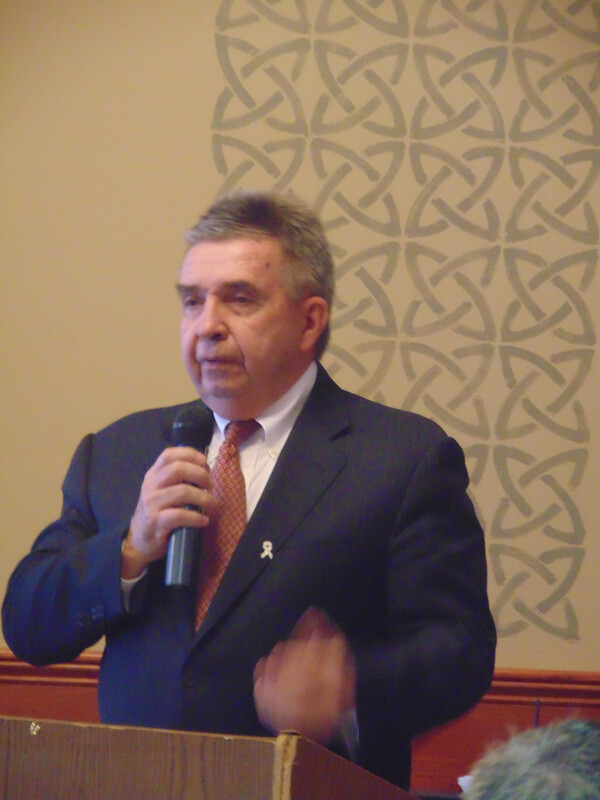 Tim Whelan, (below), State Representative for the first Barnstable District saw domestic violence close-up as a Massachusetts State Trooper. He told of his first case, pursuing an abuser who kicked his partner as she laid in bed. Having fled, Whalen managed to catch the abuser, who offered no resistance. This, Whalen said, was not surprising---characteristic of the cowardice that is an abuser's signature. Below we see Barnstable County Sheriff James Cummings, also a retired Trooper, whose agency helps steer abusers away from that vicious cycle. Independence House's Executive Director, Lysetta Herge-Putnam, below, urges that we "reframe" the issue of domestic violence, that all too often we ask the wrong questions, like "Why did she dress that way? ", "Why did she go that bar?" or "Why does she stay with him?" Instead we might ask, "What can we do to help?" 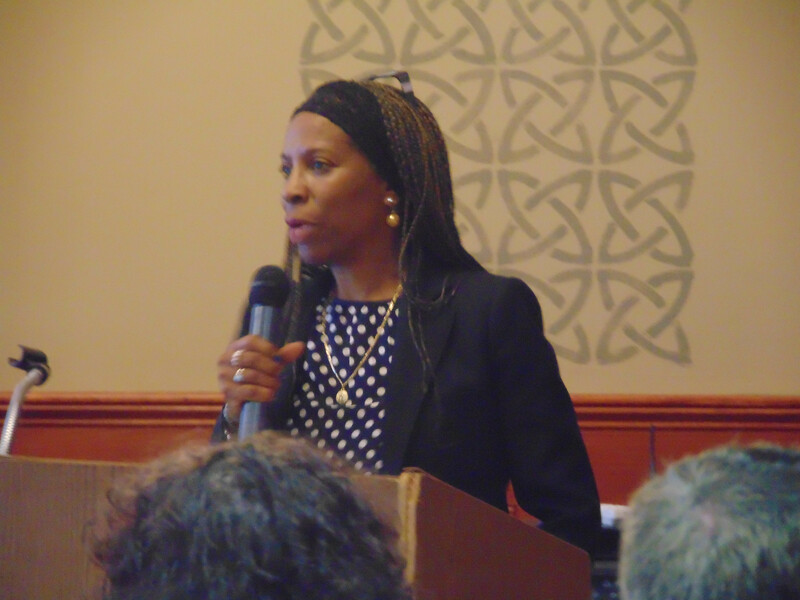 Ms. Herge-Putnam shared the approach of activist Tony Porter, who asks men to step out of their "man box," to reexamine how we as men are conditioned to act and how we can challenge those assumptions. Independence house has been a critical resource for women and girls in need. None should hesitate to seek help. Above we see YPD Lt. Patrick Carty, self-defense instructor and leader of YPD's Domestic Violence Team. Carty has helped promote victim safety through self-defense courses and proactive/preventive visits to problem households. Beside him is Dennis Amato, also a self-defense instructor. Carty and Amato presented a check to Independence House for promotion of female self-defense training. Below we see Brian Renard, LICSW and local community leader, who promoted the "ManKind" Project. This national effort aims towards "Building and supporting the emotionally mature, accountable, and compassionate male role models that our communities need." Local events in support of the "ManKInd" project are slated for coming months. Barnstable High School has a interesting "MVP Program," to "train students to be active bystanders who promote healthy interpersonal relationships and prevent forms of oppression." MVP team members Kyle Anderson, Robert Welch and Jack Gilberti took the pledge. Below we see Anderson and Welch, who gave inspiring, eloquent speeches on the "learning curve" that accompanies these issues. It's a pleasant surprise seeing these young people drawing connections for which many adults wait years. Most importantly, for the abused, don't hesitate to seek help. People care. Over 400 people came out in the cold Saturday to show their support for the men and women of local law enforcement. The brainchild of local residents Patrick Foran and Rick Gleason, this first-ever event garnered immense support on social media sites and elsewhere during the short period of time since its announcement. Local supporters brought flags and signs of support and officers from almost all Cape towns came to represent their departments. The Barnstable County Sheriff's Office was represented as well as the Massachusetts State Police. Yarmouth Police, both on and off-duty lent support to the rally, including Chief Fredrickson and Deputy Chief Xiarhos. Host Rick Gleason was joined on the podium by Brian Mannal, Sheriff Cummings, District Attorney Rollins, Congressman Keating and State Representative Tim Whelan. Army Chaplain Don Florio led the large group in prayer. State Representative 2nd Barnstable District Brian Mannal addresses the crowd. The speakers reflected on the challenges of law enforcement, the dedication of the profession, the value of nonviolent freedom of expression and the unwavering support we have for the men and women in blue. 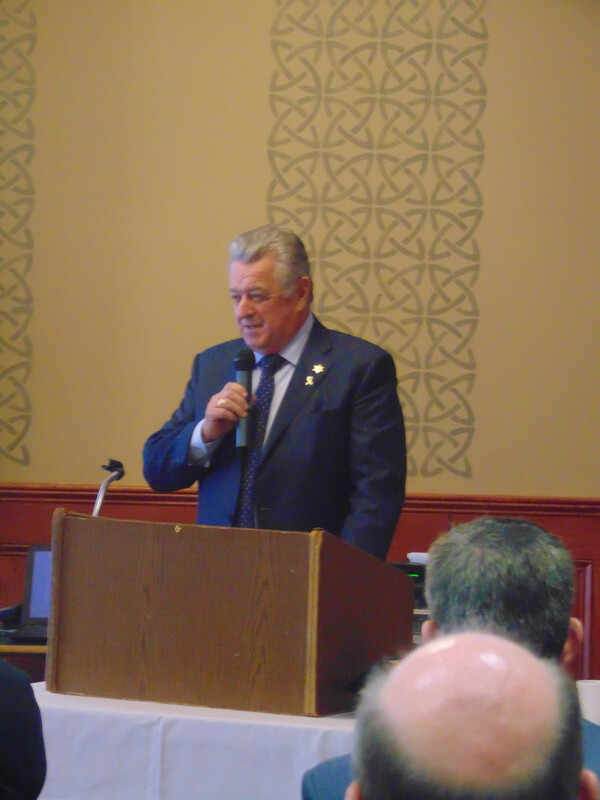 Representative Whalen led the group in a Pledge of Allegiance. When interviewed by a Boston news outlet, Representative Whalen made a critical point about this gathering. This is not a protest in response to protests. Indeed all here support the First Amendment Right to peaceable protest. But some recent press coverage has not focused enough on the good things our cops do every day. Many feel as a community that some recognition and support for law enforcement is due. Mutual respect is key to solving problems in our communities and only through closer community/police connection will we overcome today's challenges. It all starts here, in our own communities. As one who frequently walks the woods of Cape Cod I have come to some disagreement with friends about whether or not bears trudge just below our radar on old Cape Cod. 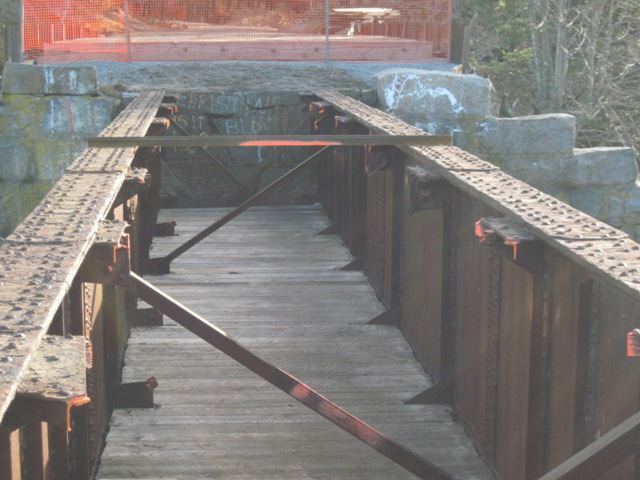 Now we all know about the "Cape Cod Bear" but do others still remain? One friend says "no way" to which I respond, "They don't make it a point to be seen." I found some very large pawprints in the woods last winter but that was the only clue I could find-until now. Some critter managed to claw the bark off a tree. 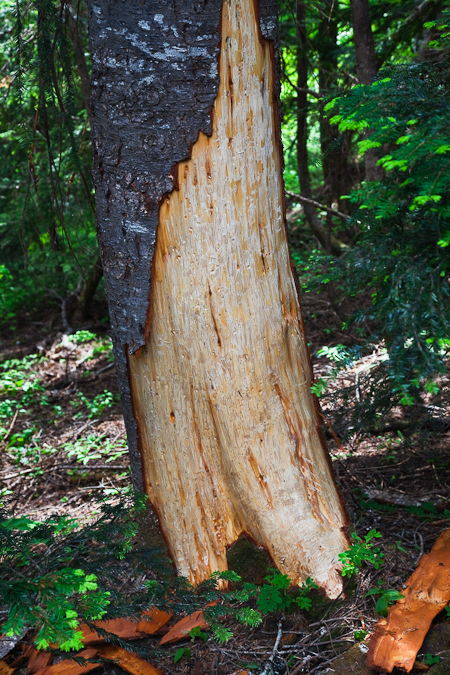 I did a Google Image search for "bark stripping by bears and found dozens of similar shots. Now the last thing I want is to spur bear hysteria and get these poor critters trapped. Just let me say, they live among us and shouldn't bother anyone if we are calm, careful and don't feed them. Nature flourishes just below our radar and for that I am grateful. Want a big fluffy dog like ours??? Well it's been quite a hiatus, with the LSAT and first year of law school, but the Poet's Perspective is back online. I'd like to share some recent photos in the spirit of taking the road less traveled. Carpe Diem!!! From Harwich, Cape Cod! Many of us were overjoyed to hear of WildCare's recent rescue of snapping turtle eggs from a deceased mother. Their release into the wild was a fulfilling experience for staff/supporters. 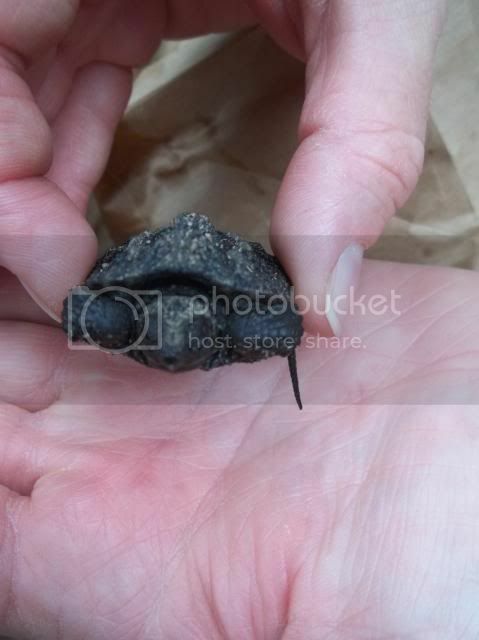 Thanks to the sharp eye of my son Brandon, we were able to rescue a very dry baby snapping turtle who was near death and far away from water. We figured the little trooper was disoriented from last night's rains. We found him/her uphill from the power lines at Nickerson State Park, a stone's throw from the entrance and very far from the nearest water at Triangle pond. This is how he/she looked before we gave some moisture from our water bottles. We quickly brought her where she needed to go and when she reached water, instinct kicked in. She quickly burrowed in the muck to seek some R&R. It was the highlight of our day! The banks of the Herring River in Harwich are swirling with exceptionally high water and today a huge chunk of the shore, complete with vegetation broke free and began rotating in the current of the reservoir outflow pipe. The piece that departed is from the very narrow (6-10 feet) piece of land separating the reservoir from the Herring River. You don't see this every day!